My experience observing triathlons is limited. Save for a couple of Ironman competitions in Chattanooga, I’m a newbie. After a early morning drive in from Destin, we began our Gulf Coast Triathlon experience. It occurred to me while spectating the 2016 Gulf Coast Triathlon that this Panama City Beach venue must be one of the most beautiful in the world for a race like this. With the aqua-green gulf coast waters and the blazingly white sandy beaches this place has got to be a favorite of tri-athletes everywhere. The 2016 edition was no exception. With 480 tri-athletes from locations as far north as Burlington, Ontario Canada and as far west as Austin, Texas these tri-athletes believe the stunning Panama City Beach venue is worth the trip. With a legacy of 34 years, The Gulf Coast triathlon is surely one of the top must-go triathlons in the country. The weather was unmistakably the most gorgeous day this spring. Cool enough in the morning. Comfortable in the shade. Swimmers were noticeably chilled which quickly changed when they jumped in and got to pumping. The water that day was really, really cold. What is so amazing is that these tri-athletes have their ages temporarily tattooed on their calves. I saw leaders well into their 50’s. And fast followers into their 60’s and 70’s. Guess there’s hope for a generation of healthy active baby boomers. I’m sitting under the sea-blue beach umbrella. Guys like me do this to avoid getting too much sun. There’s just enough reflecting off the sand for a nice warm glow and an easy tan for a fair-skinned person like me. This is one of the most pleasant days ever. It’s about 80-85 degrees with a steady breeze coming off the ocean. It couldn’t be better. It’s almost like heaven on earth. The roar of the ocean waves overpowers radios and voices. A child’s voice rises faintly over the waves, He’s hollering with delight as a wave topples him over. It’s breezy this afternoon with a crystal blue sky and a whisper of clouds to the east and a tiny ripple of clouds just ahead above the horizon. The water is the most beautiful emerald green you can imagine with white waves breaking into a seafoam green. Just beyond the shallow water is the deeper, darker, blue-green gulf waters. There’s a tiny white dot on the horizon - must be a fishing boat. Destin’s famous for great fishing. Just in front there’s a young couple wading out into the gulf. Out maybe 100 feet, the water is up to their waists. The gulf water is shallow here in Destin for a long haul out into the gulf. There’s no better place to play in the waves than here. About half way out to the water’s edge there’s a young mom and her baby girl building a sand castle. The little girl’s as sweet as she can be, blonde, curly-headed, having a great time. Two little fellas (maybe twins) sit in the shallow water. As the waves break they squeal with delight to the top of their lungs, having a fun time at the edge of the waves. Dad walks out and wags his finger at them and tells them to quiet down. They pout for about a micro-second, then another wave hits and they resume their play. What is it about the beach that kids love so much? They’ll play all day long if you let them. That must be why mom’s love the beach so much. The kids play all day and give mom a little peace for a while. So mom gets her peace and the kids have their fun and all’s well for a moment in time. All of the sudden, excitement ensues, and for a moment time stands still. A young girl, looks to be maybe 12, has floated way, way out way too far. I can barely see her. Her mom looks up from her romance novel, jumps to her feet, and tears across the beach toward the water. Next to her a heavy-set man jumps to his feet running to the water. Everybody’s watching now. Two young guys take off racing across the beach. The heavy-set man plunges into the water and starts swimming toward the girl. Must be her dad. He wears out about half way there and has to stop. Mom’s standing at water’s edge looking anxious and worried. Meanwhile the two young guys are swimming out. Together they pull the girl and her float back to the safety of shallow water. Mission accomplished. Everything’s OK now, no problem. Time starts back. Everyone goes back to their books. There go two gulls skimming across the waves and a single sandpiper scurries up to umbrella next to us. He’s curious. Head bobbing up and down, inspecting the situation. He does a “walkthrough” of the area. Picks up a scrap of bread and flies off. An observation. Curious birds appear when people get up from their chairs. They search for scraps of food, something that might be left behind. Smart little survivors. I’m getting hungry; it’s almost 2 o’clock. In a few minutes Jeanne and I will walk down the beach to the Whales’ Tail and grab a bite. Whale’s Tail has a breezy covered deck overlooking the ocean with picnic-style tables. Not a bad seat in the house. We’ll get the southwestern chicken wrap and onion rings with something cold to drink. We’ll sit and eat and enjoy the ocean breeze and scenic view. Whale’s Tail’s a pretty famous place on Scenic Gulf Drive near Majestic Sun resort. There is a guy laboring over a umbrella anchor that twists into the sand. He’s setting up his umbrella now. A beautiful spot right out near the water’s edge. The wind whips up, the anchor holds tight and the umbrella stays put. It works! There’s a 40-something couple braving the waves trying to make their way out. She’s coaxing him out there and he resists. “Come on honey, come on out.” He doesn’t want to go out much further. She wins and he heads on out. They’ll have a good time. A busy young dad with his two young babies stakes out his spot for the day. He’s got an entourage of equipment. Chairs, umbrella, shovels, buckets, blankets, cooler - you name it, he’s got it. One of the kids look to be 2 or 3 and the other maybe 5. The 5 year-old with swimmies swelling around his arms totes his bucket and shovel. He’s going down to the water to have some fun now and build a sand castle. 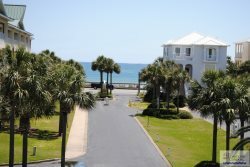 The perfect stay in Destin is just a click away. There’s still time to book a May stay. A very few condos are open in the next week. Some great deals are waiting for you there. Come enjoy the best time of the year, in Destin! I’m sitting on the balcony of Majestic Sun and it’s chilly this morning. A typical spring morning at the beach. There’s a light fog hovering over the gulf waters waiting for the sun to come out and burn off the haze. Looks like it’s going to be a pretty day. We’ll see. The beach service guy is diligently going about his daily routine, setting up the umbrellas along the high tide water line. That’s hard work but he’s young and can handle it. Great way to spend the summer if you’re a hard worker. I’m sitting here thinking there are a few folks, like you, who wish they could getaway to the beach this spring. It is such a wonderful time to visit Destin. The weather is mild, a little chilly in the early morning, but warm and gloriously sunny in the afternoon. Here’s to a glorious spring day in Destin. Enjoy!